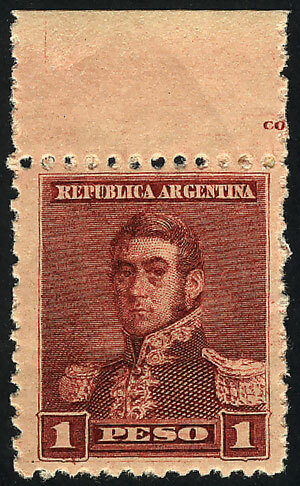 GJ.148, $1 San Martín, small sun wmk, perf 11½, sheet margin, very fresh gum, paper hinge on back, VF quality! Lot 225 - Argentina general issues - Guillermo Jalil - Philatino Auction # 1913 ARGENTINA: "Clearance" auction with very low starts and many interesting lots! Lot 226 - Argentina general issues - Guillermo Jalil - Philatino Auction # 1913 ARGENTINA: "Clearance" auction with very low starts and many interesting lots! Lot 227 - Argentina general issues - Guillermo Jalil - Philatino Auction # 1913 ARGENTINA: "Clearance" auction with very low starts and many interesting lots! Lot 228 - Argentina general issues - Guillermo Jalil - Philatino Auction # 1913 ARGENTINA: "Clearance" auction with very low starts and many interesting lots! Lot 451 - Argentina general issues - Guillermo Jalil - Philatino Auction # 1916 ARGENTINA: "Budget" auction with many good lots at VERY LOW STARTS! Lot 136 - Argentina general issues - Guillermo Jalil - Philatino Auction # 1916 ARGENTINA: "Budget" auction with many good lots at VERY LOW STARTS!